Yesterday I had a lovely Pym-ish morning. Hubby was out power walking in the cold wind. But I was lolling on the sofa in our sun room, cup of tea at my elbow, gazing out the window at the sun sparkling on the water, the receding snow on the lawn, and the ducks waddling around on the ice that, carried by the swift spring current, flowed past our waterfront. I was lolling and rereading Excellent Women, my favourite Barbara Pym novel. All was quiet, except for the rustle of a page or the clink of my cup in the saucer. I love quiet, gentle books. That might sound odd coming from someone who just wrote a post on books about war, and who loves mysteries and crime fiction; I've written several posts on murder and mayhem. But every now and again I need a Pym fix. I need to read quiet, lovely books that make the smallest details of everyday life seem endlessly interesting, and worthy of observation and dissection. Books like those written by Barbara Pym. Pym's novels are the very opposite of the sweeping saga, or the shocking blockbuster; they could never be described as "stunningly ambitious" or "jaw-droppingly suspenseful." They are lovely, gentle, wry tales of unremarkable Vicar's daughters, and quiet middle-aged spinsters. Pym's characters live mostly unnoticed by society, always in the background of life, but their skills of observation and ironic sense of humour are... well... stunningly sharp. I first discovered Barbara Pym when I found a copy of Excellent Women at a used book store back in the 1980's. I loved her work immediately, but it seemed that no one else I knew had heard of her. So I was delighted when, after mentioning her name to a new colleague a few years later, I arrived at work the next day to find a pile of Pym's books on my desk. This was when my friend S and I discovered that we were indeed kindred spirits, especially about books. I read all of my friend's copies of Pym's novels, and then went out and bought my own copies. I adore her work. I love the way she writes of the minutiae of everyday life. The church jumble sales, the click of knitting needles, a string bag holding a few bits of shopping and a library book, endless cups of tea. I love it all. Her books never shout, are always calm, and the characters eminently sensible. Too much emotion, one learns, is in poor taste, adversity is to be squarely faced, one's tears must be dried, one's shoulders set and then after a cup of strong tea, life must be "got on with." There's just something so quietly hopeful, and restorative about reading Barbara Pym's gentle stories. And rereading Excellent Women lead me to my other favourite book of the same ilk, Anita Brookner's Hotel du Lac. Another quiet book about an unassuming writer (and spinster) named Edith Hope who lives on the periphery, makes wry observations about life in general, and other women in particular. I love Edith's take on what she calls "ultra-feminine" women, those "complacent consumers of men with their complicated but unwritten rules of what is due to them. Treats. Indulgences. Privileges. The right to make illogical fusses. The cult of themselves." I guess we could all name a few "media darlings" who might fit that profile. As Mick Brown shows in his excellent piece in The Telegraph, "A Singular Woman," Brookner, like her characters and those of Barbara Pym, also looks life and adversity squarely in the face. I like that quality. You should read Brown's interview with Brookner. She is a remarkable woman. Neither Pym nor Brookner married, remaining spinsters all their lives. And so their seeming preoccupation with unmarried women seems natural. Spinsters have long been relegated to the bottom rung of society... just read Jane Austen. But unlike Austen's characters, many of Pym's and Brookner's heroines choose spinsterhood over marriage. In fact, Brookner's character, Mildred, in Hotel du Lac chooses spinsterhood twice. I hadn't really thought about this until I read Hannah Rosefield's article in The New Yorker. "Barbara Pym And the New Spinster" looks at "female singleness" and how the spinsters in Pym's work (and I think in Brookner's) choose to remain single "in part because marriage does not seem to offer an improvement on their current state." You can read Rosefield's article in its entirety here. In her article, Rosefield also mentions a new book coming out this month. Spinster: Making a Life of One's Own, written by Kate Bollick, is according to Rosefield, "part memoir part social history." Rosefield says, "Bollick hopes that 'spinster' might become 'shorthand for holding on to that in you which is independent and self-sufficient, whether you're single or coupled.'" Cool. So...in that case, I think... I mean, I'm pretty sure... that despite twenty-five years of marriage... I might still be a spinster? Hmmmm. Now, I'd better go make myself a cup of tea and think about that. It might even require more lolling on the sofa. And maybe some research. I'll have to get myself a copy of Kate Bollick's new book. And of course do more gentle reading. Now where did my copy of my second favourite Barbara Pym novel? 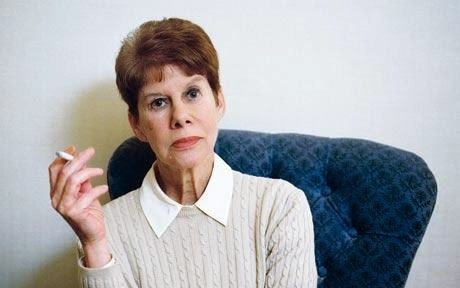 Are you a Barbara Pym or Anita Brookner fan? Labels: Anita Brookner, Barbara Pym, books, Excellent Women, Hotel du Lac, Kate Bollick, Spinster: Making a Life of One's Own. I read some of Pym's novels years ago...hotel du Lac is an exquisite piece of writing. Enchanted April is another lovely book to read when one is seeking peace to go with a cup of tea! I am currently reading Elizabeth George's first in the inspector Lynley series of mysteries and thoroughly enjoying it. I haven't read Enchanted April, although I've seen the movie a million times. You have many, many hours of enjoyment ahead of you if you're just starting the Inspector Lynley series by Elizabeth George. Although the last book was up to her old standard, I found the two previous to that were not. Her early books are still my favourites. I had never heard of Ms. Pym before I saw your post on G+ but will now do a library search as she seems right up my street. Thanks for the tip. Oh, you must give Pym a try. Thanks for stopping by. I've enjoyed all of Anita Brookner's books, but Barbara Pym is one of my very favorites. Re-reading her books got me through one of the worst times in my life, and I've re-read and enjoyed her books in the best of times as well. I've passed them on to my daughter to read during her maternity leave, and she too has become a Pym devotee. Wish you and I lived near each other--we could start a book club for sure! We would have an awesome book club. With food and wine of course! Don't believe I have but am going to look for her now. Sounds right up my alley. My favorite "fuzzy blankie and tea" books are by Rosamund Pilcher. I have read them over and over and now need new copies. 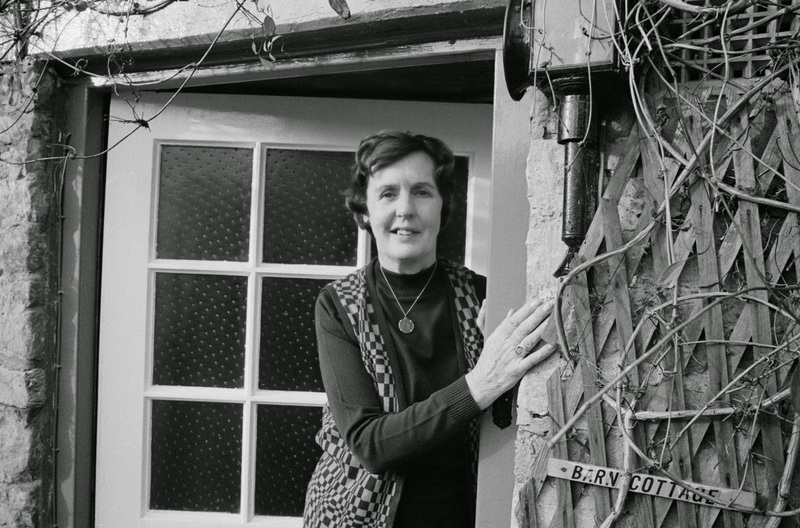 Hope you like Barbara Pym! Thanks for reading. My favorite ' gentle' books are by Alexander McCall Smith but I will look out for Barbara Pym . I can only cope with so much 'murder & mayhem' . I like McCall Smith as well. One needs a rest from murder every once in a while. Hotel du Lac was a lovely book. I enjoy quiet reads very much. I will look for Excellent Women. Thanks for the recommendation. You're welcome Jennifer. Thanks for reading...and for the "headsup" tweets. Thanks, Kim. I will definitely look for those. I discovered Barbara Pym's books about 25 years ago and have loved them ever since. Excellent Women is one of my favourites! My books, at the moment, are "gentle" mysteries - Alan Bradley's series about Flavia de Luce, 11 year chemist and sleuth! Thanks for your book recommendations, Susan. I am a reader of your blog and love your posts, but have never commented. I read Bradley's books as well. I love that Flavia seems quite grown up, yet she has named her bicycle. I'm so happy to hear that you enjoy my blog. Thanks for that, Barb. Thanks Mary-Rose. Isn't P.D. James wonderful? Her books are gentle, in a way, aren't they? Or at least they're not filled with gore despite being murder mysteries. Thanks for stopping by. I am forever grateful to the English lit professor at university who told me that if Ioved Jane Austen, I really should try Barbara Pym. I have read and reread her novels many times since then, and Excellent Women is my favourite. I am not familiar with Brookner, but am looking forward to making her acquaintance; thank you for the recommendation! If you love Pym, you'll probably like Brookner too, although she can be a bit darker than Pym. Hotel du Lac is my favourite. Thanks for stopping by, Denise. oh, golly, i have loved barbara pym for decades but never met anyone else who reads her. what a wonderful post. i have also read many of your readers' recommendations, such as ENCHANTED APRIL and enjoyed them very much. i recently discovered THE PROVINCIAL LADY series by e. m delafield. despite the fact that they were written in the '30's and '40's, i found the lady's problems and challenges timely and really funny. altho she's a married woman, she is astonishingly independent, given the times. That's what I felt until I met the colleague I mentioned in the post. It's amazing to find out that so many people love Pym as much as me. I will look for that series you mention, Susan. I like books from that era. I love it when readers make recommendations back. Hope you see this Susan. Just got The Provincial Lady from the library. It is too funny. I'm loving it. Thanks for the recommendation! I just ordered A Glass of Blessings from the library; it's the one Pym book I haven't read. And there are several Brookner ones I haven't read yet. But I'm just starting the new Rachel Joyce....so they'll have to wait. Oh...too many books! "The cult of themselves." Wow, what an observation and so contemporary.